Readers interested in The Heavenly Bride can create a free account and log in. Paid accounts get to see new pages. Free accounts can read up to a point and download as many wallpapers as they want, even the new ones when I find time to make them. I have more I’d love to do with The Heavenly Bride, but it genuinely depends on readership support as that determines how much time I have. This post has been edited to kill some of my drama queenliness. Maybe someone will like this page. Maybe someone will comment on this charm idea. Maybe I can finally earn enough to pay the taxes. Maybe someone will at least say something. What I’ve been getting instead is a mix. There are people who are supportive and let me know they’re there on occasion. When I’m just too stressed out, that is drowned out by the large amounts of people who feel I should give everything away for free while at the same time treating my hard work as worthless. Finally I have realized I just can’t do this anymore. I can’t politely accept being invisible anymore. I almost took Heavenly Bride down completely, but I’m going to try this model instead. To sum up and be less ambiguous, it appears my worth is considered worthless because of my generosity. So that has to change. I’m sorry for those of you who may be knocked out of the Heavenly Bride loop because you can’t afford the next book when it’s released. It’s just how it has to be. -> bam 2 flies with one stroke. Go and work hard! You sure have my support. …. I just dunno what to say. Well, obviously I should say thank you. And mean it. Which I do! I should print sentiments like this and put them on the wall for when I feel discouraged. 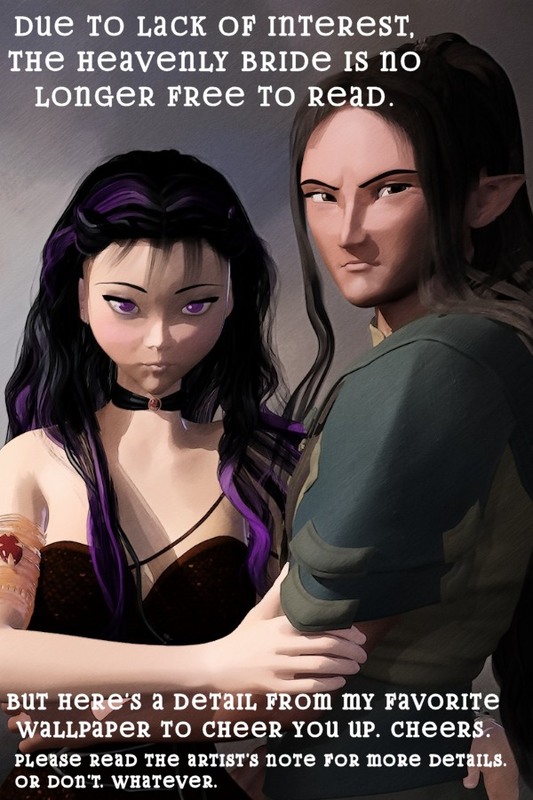 Aww, Jiu liu looks almost jealous there.. “Taus is mine, you can’t read her.” While Taus is somewhat unhappy about it all. Yes, sums the rant up quite well. I have nothing against the change in format though. That is my comment on the picture, which I’ve usually tried to hide from public since they seem somewhat odd at times. Yeah, he is a little jealous. 🙂 I was just thinking before you commented that I needed to tweak the script up a bit. And thanks for the comment. =^-^= I’d say they’re worth their weight in gold, but uh…. Even then they are a bit.. not on the heavy side unless you use old rock tablets and carve the comments into them. I would just like to let you know that I love Heavenly Bride and every time a new one comes out I am so excited! :) I am a bibliophile and am always reading and I have read many books and mangas but your work is fantastic. It is not only an interesting plot full of relateble characters, but it is also cleverly done and I enjoy your artwork. I have gotten quite a few of your other books too and I support you wholeheartedly! :) I only wish I could do more, but college tends to take all my money. :( I just wanted to let you know that you have talent and I can’t wait to see what comes next(and hopefully make you smile and brighten your day:)). I hope you took advantage of the wallpapers. Updates here have been super slow this past month because of some family upheaval and having to build the set for the next scene, but it is in the works. I’m glad everyone is being so patient.